Yep, I can get everyone in my family to drink spinach (except the baby–she wouldn’t drink it in her milk–or would she? ;) How? I put a handful of spinach in my smoothies. Remember my kids are not the best vegetable eaters in the world, so I counteract by doing more deceptive cooking and pureeing. Thanks to my new blender, which I received for Valentine’s Day, I’m back in the smoothie bar business. I’ve owned two Cuisinart blenders and they have both burned out. One was new and one was used. 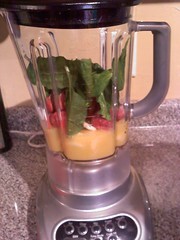 The new Cuisinart blender did very well and pureed spinach and ice wonderful. The second used one which had a lower voltage and did not do as well. My hubbie bought a Kitchen Aid this third time around and I used it three times the day after Vday. Now you can see why the Cuisinart might have burned out after several years. I do some serious blending and pureeing around my house with four kiddos. I know a Vitamix would crank out some serious whole food smoothies, but that’s a hopeful purchase one day. Here’s the easiest recipe in the smoothie business. My three year-old calls thems smovies, so move over regular smovie and get ready for the new healthy one. You can substitute milk in place of oj if you prefer a frosty consistency rather than a slushy. Try it both ways for fun! I used to call this the Tinkerbell Smoothie when my daughter was very young and then we called it the Incredible Hulk smoothie when my son came along. Smoothies may have a slightly green tinge, depending on the amount of spinach you add. That’s why we called it Tinkerbell for girls and Incredible Hulk for boys. It’s just a fun name if they ask why it looks a little green, plus you can talk about all the wonderful powers of the characters. What’s your favorite smoothie? Have you thought about duplicating it at home? 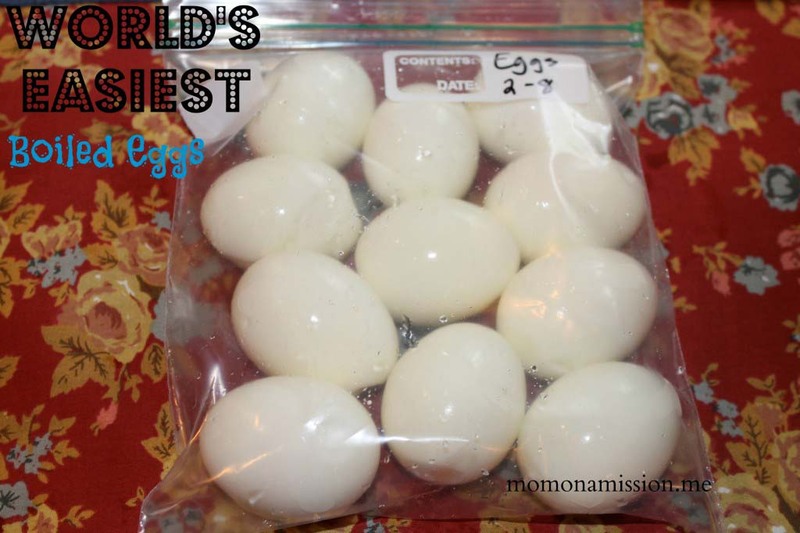 Better yet, have you thought about making individual freezer bags with directions to add liquid ingredients. This is my next freezer to do. No one has to ask you how to make them. They just add the liquid amount on the bag. Pop the bag back into the freezer for the next refill. Smoothie bar is open! 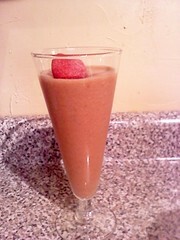 This entry was posted in Beverages, Eggs + Breakfast, Tips/Tricks and tagged banana, blenders, milk, orange juice, smoothie, spinach, strawberries on 18.02.2011 by admin. Interesting Thoughts, I have prepackaged fruit smoothie components into specific servings and I would cherish to do the same detail with green smoothies. Has any person attempted freezing their spinach earlier than utilizing it? Have to I blanch it? Does it improve the flavor or texture of the smoothie at all? My idea was getting my frozen fruit and spinach in baggies so all I had to do in the early morning was throw it in the blender and add water or juice. Many thanks!